Make snack time a little sweeter with the Keebler Elves and the incredible taste of Keebler Soft Batch Chocolate Chip Cookies. These delightful treats are fresh from the Hollow Tree and feature scrumptiously soft cookies with real chocolate chips for a yummy, chocolatey burst in every bite. With an enticing home-baked taste, these delicious cookies have been baked to golden perfection and are made with pantry-perfect staples like enriched flour and real chocolate for a satisfying anytime dessert. No matter your age, Keebler Soft Batch Chocolate Chip Cookies are perfect for snacks at school, the office, traveling, lunchtime, at the game, and more—the Uncommonly Good options are endless. Try them with ice-cold milk or coffee—or take your dessert to the next level and create an indulgent ice-cream sandwich. 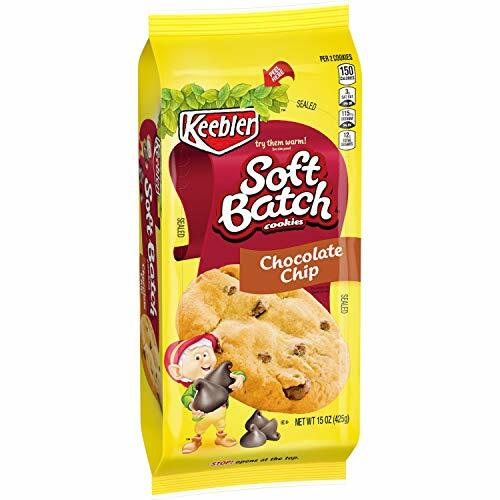 Satisfy your chocolate craving with the simple goodness of Keebler Soft Batch Chocolate Chip Cookies. View More In Chocolate Chip. Fancypants Cookies - Chocolate Chip - Case of 6-5 oz. Fiber One NEW! Crunchy CHOCOLATE CHIP Cookies + FREE 19 oz Sports Beverage Bottle. 6 Cookies in Each Box (6 PACK). A total of 36 delicious cookies. You’ll be one smart cookie!